The bag men have it tough these days. See, despite the brand spankin' new C-note unveiled by the Treasury Department a few days ago, Ye Olde Benjamin just isn't all that he used to be. Life is just getting harder and harder for the poor thugs who have to carry around the Big Money. The culprit? Inflation. See, The Office of Management of Budget publishes the official figures for how much inflation is from year to year. Those figures can be recorded and flipped to see how much inflation has decreased the value of money over the years. For things like, say, a suitcase full of money. In this case, a suitcase full o' money today is only one third as valuable as that same suitcase was in 1977. 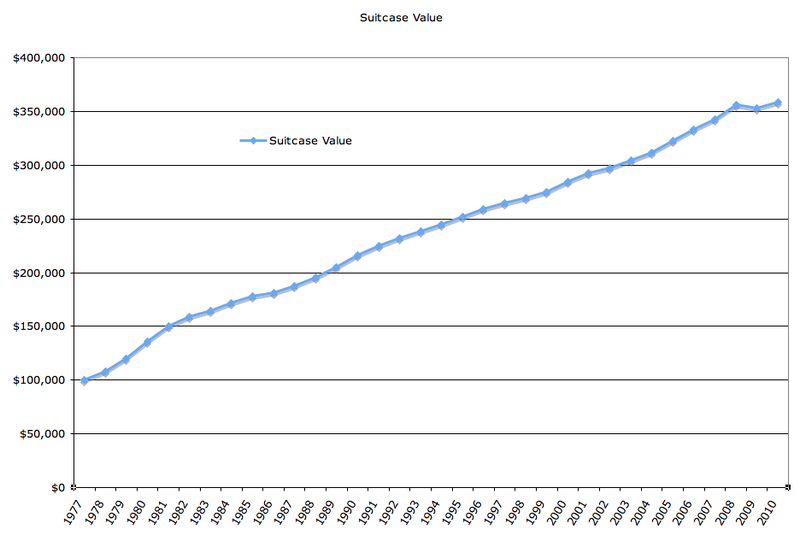 The following chart illustrates what I'm getting at, for a hypothetical "suitcase value" of $100,000 in 1977. 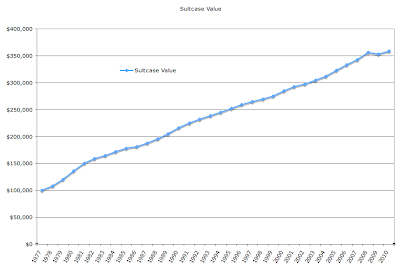 See, if your average suitcase could hold $100,000 in 1977, the poor thug would have to drag around three and a half suitcases today to be able to seal a deal of equivalent value. Not that I regularly tote around suitcases full of money. Come to think of it, I have never toted around a suitcase full of money. 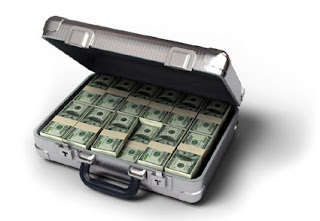 But if the Department of Treasury wants to address the needs of shady businessmen and others who may need to tote around suitcases full of money, they may want to consider a $500 note or even a $1,000 note. Poor old Benjamin Franklin just isn't worth what he used to be worth.